Fine dining restaurants serve very beautiful and meticulously done dishes. Customers are not only given a visual treat but are also given a great-tasting experience. Menus play an important role in attracting customers as well as keeping loyal customers happy. They are effective marketing tools that can make or sometimes break a restaurant. 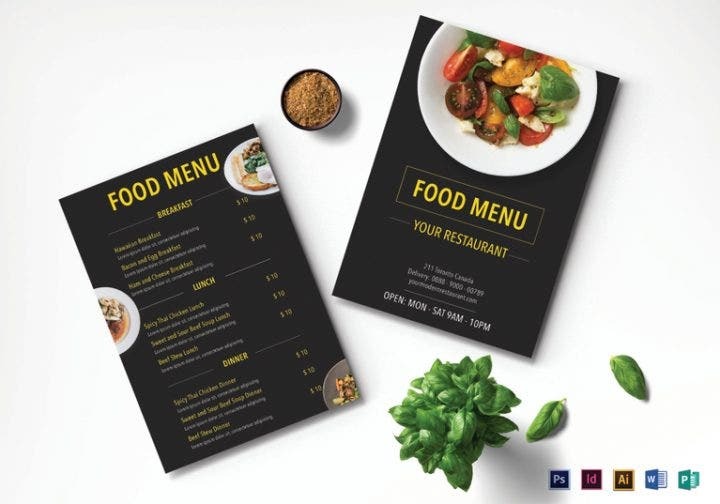 A well-designed menu will entice customers to enthusiastically place their orders (check this menu design hacks to make your customers unconsciously order more even though they don’t need to anymore) while a poorly designed one will certainly drive customers away. In reality, fine dining restaurants usually attract the stylish and the affluent. A high level of class is observed in these restaurants not only in the food and personnel but with the restaurant’s interior and exterior designs. Restaurateurs need to be careful with the designs they use for their menus as even a simple typographical error might irk some customers. 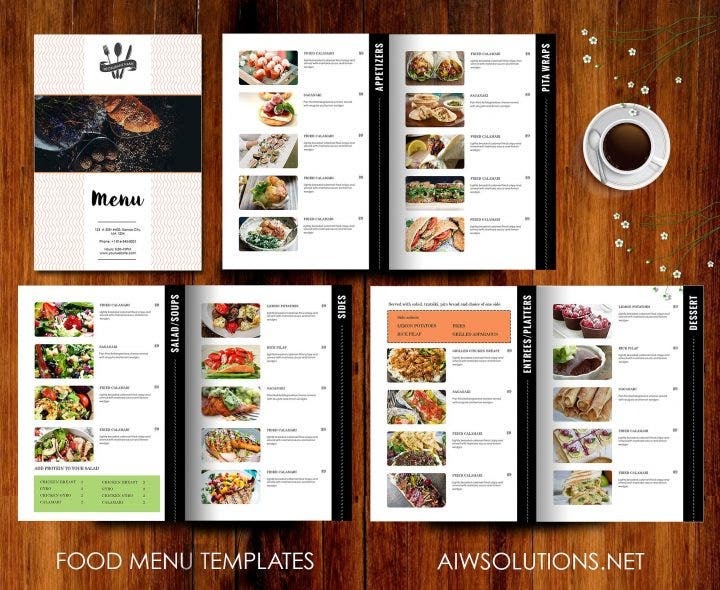 If you’re a restaurateur yourself or someone who is seriously considering to start a fine dining restaurant, then take a look at these elegant fine dining restaurant menu templates. This sample bar menu template uses some nice color combinations. A black-colored background is complemented by golden colors used for the text. Edit the details for your own restaurant. This modern restaurant blank menu template can be used for an Italian fine dining restaurant but you can edit this for your own restaurant as well. This template also uses some great food photography which will certainly be a hit with your customers. Flowers represent romance and purity so it is not uncommon that they are being used in the designs for menus. 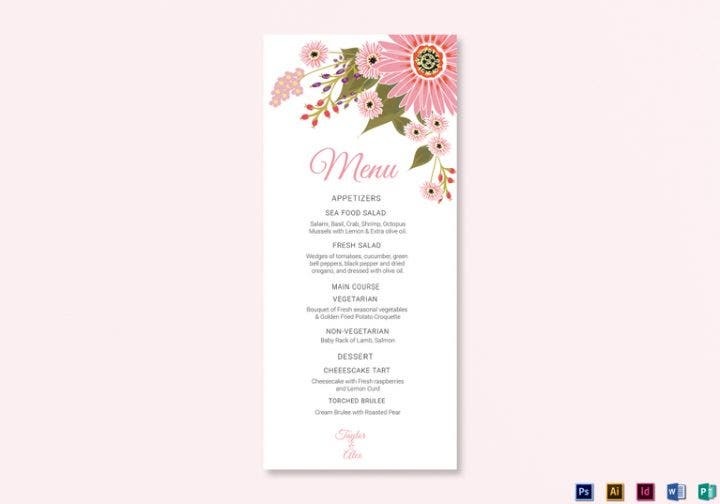 Edit this floral wedding menu card template for your restaurant but retain the flower designs located at the top right corner of the template. 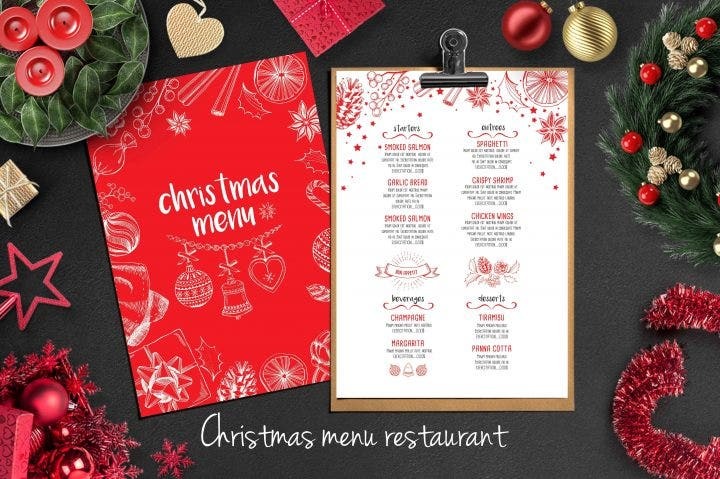 Change up your menu template for the holiday season and use this Christmas menu and flyer. The template uses some beautiful holiday colors for the holiday templates. Customers sometimes skip a meal for dessert, but a dessert can be a meal in itself well depending on its serving size. If you are serving some sweet tempting desserts, then this elegant dessert menu template should be on the top of your priority list. This is another sample menu template having a clean and simple design. Edit the text and colors for your own fine dining restaurant. “Bed and breakfast” restaurants (which are restaurants selling breakfast dishes the whole day) have been very popular the past few years. Even fine dining restaurants have now started to follow this concept. You can be sure that your diners will appreciate this template’s simple and elegant design. This dinner party menu template uses some magnificent food photography of oven-baked chicken. Use a similar photo for your own restaurant and match it with the black background. 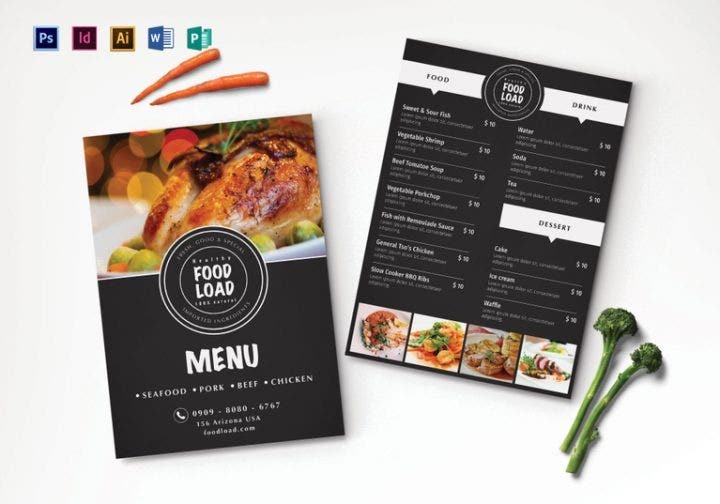 Here is another classy food menu template that is perfect for a fine dining restaurant. The font style and color used for the border complement each other perfectly. 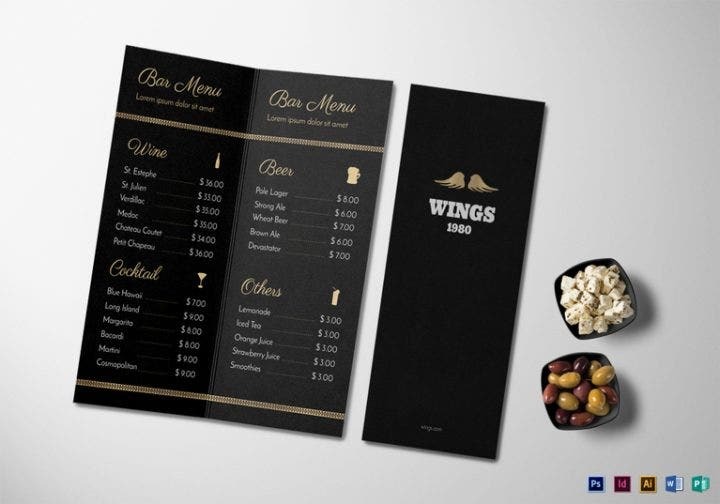 This modern restaurant menu template is one you can use for your fine dining restaurant. This template has a more contemporary and 21st century look with the layout and font styles being used. 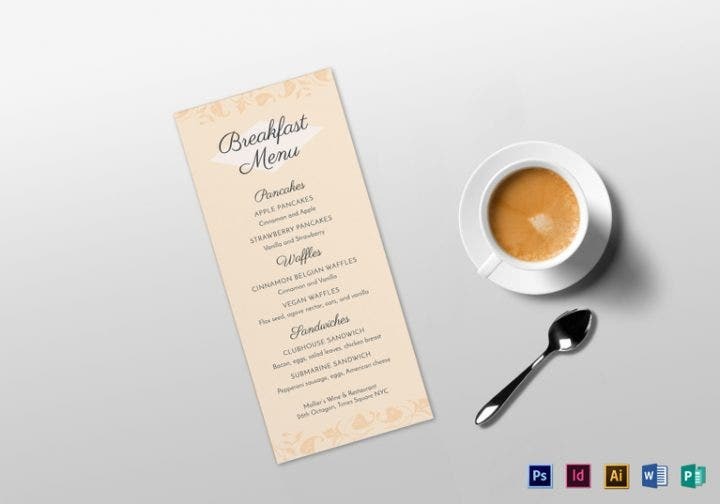 Here is another breakfast menu template for your fine dining restaurant. 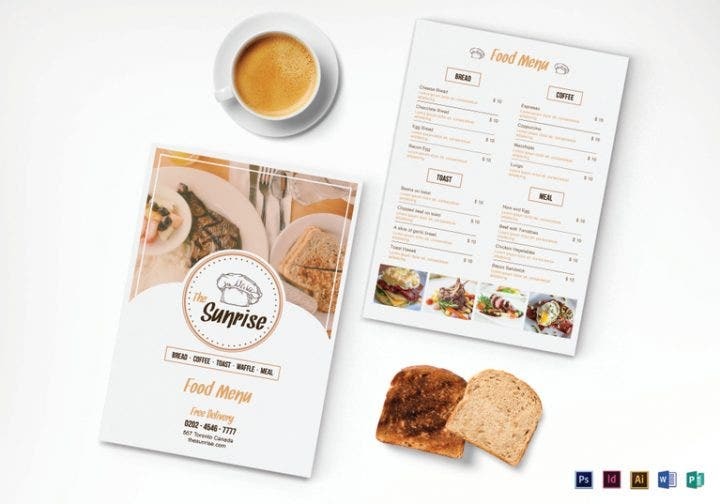 Compared to the other breakfast menu template, this one uses food photography on the menu’s cover page. The sample image above shows a piece of steak and toasted bread. Edit the photo to fit your own fine dining establishment. If you watched the 2012 movie “The Great Gatsby”, then you might be familiar with Art Deco design. The art deco design was prominent on the movie’s official poster. Art Deco was popularized in the 1930s up until the Second World War and relied heavily on geometric pattern shapes and lines as well as vibrant colors. This Art Deco menu template has a very unique and distinct design that you can use for your fine dining restaurant. The font style and border designs all make use of Art Deco art design elements. This bar menu template uses some black color for the background and gold color for the text. 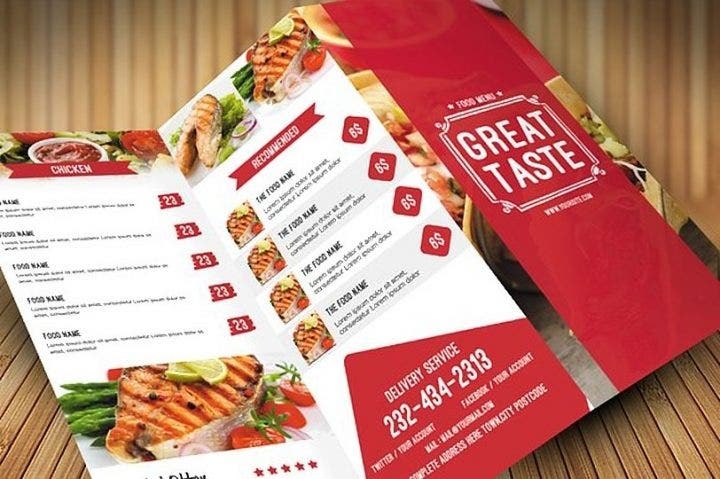 The sample text in the template’s cover page is best used for a restaurant selling chicken, but you can edit it for your own restaurant. 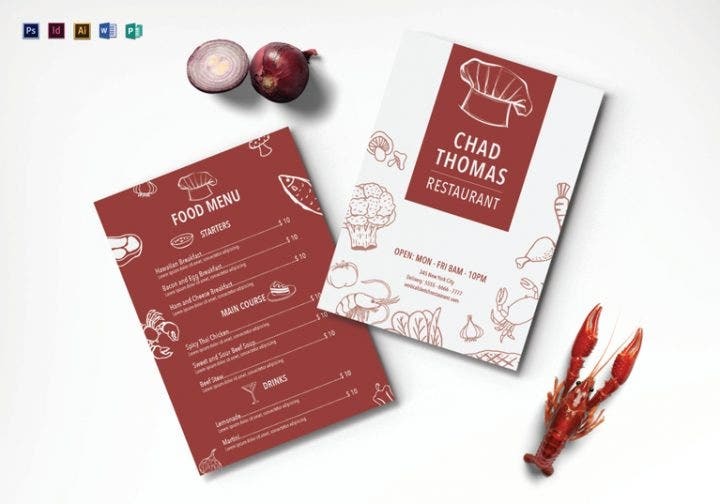 This vertical sketch restaurant menu template uses a nice red color for the template background and white for the food images. The red and white combination is a perfect match. The cover page also uses the same color combination. 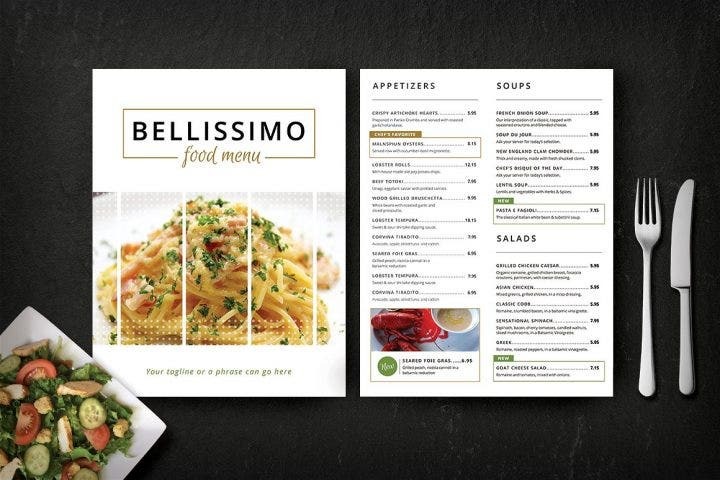 Here is another restaurant food menu template that uses some clean designs. The sample image in the template uses red on its borders but you can change it to your own restaurant’s colors. These tips are not only meant for fine dining menus but for menus in general. 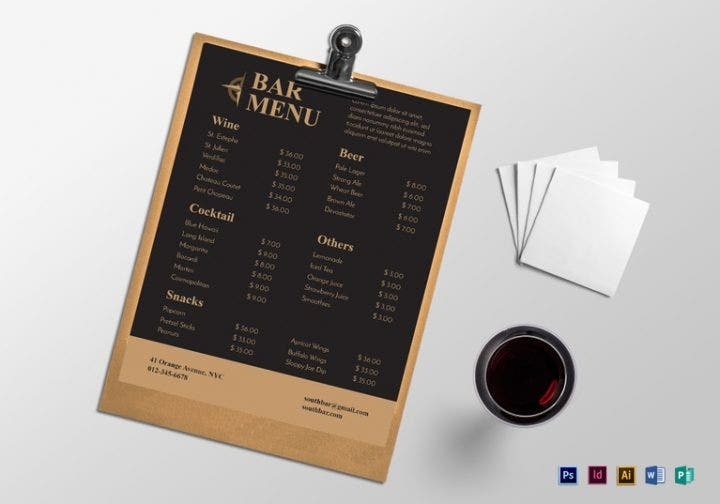 You definitely don’t want to keep changing your vintage menu designs every now and then as doing so is costly and there are other expenses that should be prioritized (such as replenishing your inventory and paying your employees’ salary). 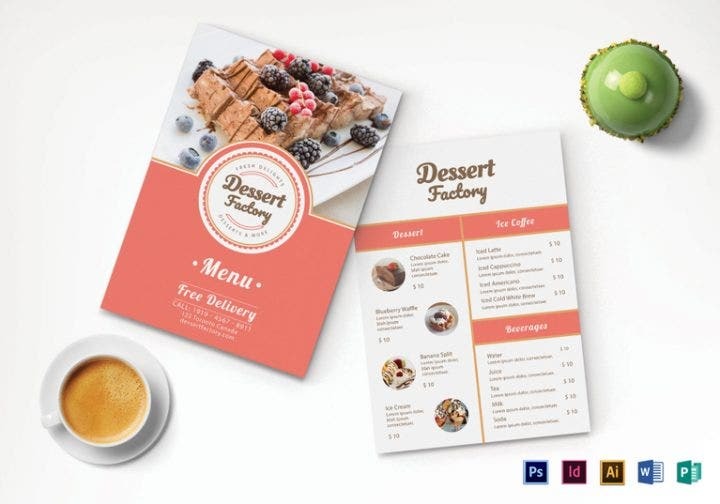 So before you make a purchase, read the following tips in choosing menu design templates. Menu designs for fine dining restaurants don’t need to have extravagant details. It is actually better to play it safe and use simpler designs. The aim of using simple designs is to please the majority of customers. Steer clear of design styles that sport casual looks like graffiti, grunge, psychedelic, or geometric patterns. Even if you are using simple menu design templates, don’t make an excuse for not applying a little bit of art. 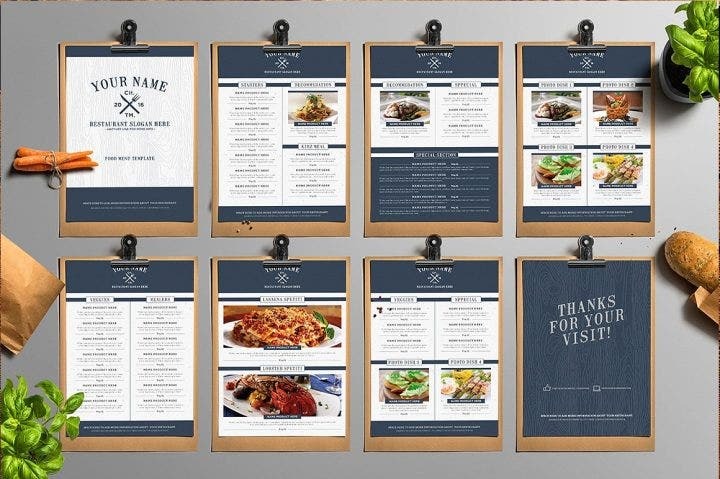 Simple menu templates should still maintain a level of quality despite their simplistic look. Making a lasting impression on your customers should be at the top of your priority list. Despite using simple designs, color is still an important factor in giving menus a better visual appeal. Using a black-and-white color combination is one of the most popular choices, but it can get dull at times. If you do use black and white, look for a third color to complement the combination (such as blue, red, or yellow). Colors add to the menu’s visual appeal that will eventually make your menus an effective marketing tool for your restaurant. Spread the colors across your menu design, either in the background, borders, text, or in the images. Both physical and digital design templates have their advantages and disadvantages. Physical designs are mostly handmade so expect a high level of detail especially if the design is made by a top designer. Additionally, physical design templates come with special freebies for UI if you order in bulk. The only downside with physical designs is that they may take too long to be delivered to your billing address. Creating a physical design template only takes a few hours, but the delivery of the design (especially if purchased from another country) will take from two weeks to two months as numerous couriers will be handling your product. If you are not in a hurry to use the template, you can order one in advance. Moving to digital templates, they are probably more convenient and accessible. All you need to do is contact the designer, make the purchase and wait for a few days for the template to be sent to your email address. Most of the time, designers do all the work and make the designs for you (sometimes for an additional fee), but if you need the templates by the next week, then purchasing digital templates is your best option. Quality for digital templates is also not compromised, as there are thousands of excellent templates in online graphic design shops like Best Templates, Zazzle, Creative Market, Etsy, Graphic River, Theme Forest, and Stock Layouts. Consulting with other people on the final menu design before you make your purchase is very important so you can gauge their reaction. Even if you are in control of the restaurant’s entire operation, you need approval from a few people if the menu design you are using will be good for the restaurant moving forward. If the restaurant is co-owned by you and a partner or a team, the decision should be based on the majority vote. 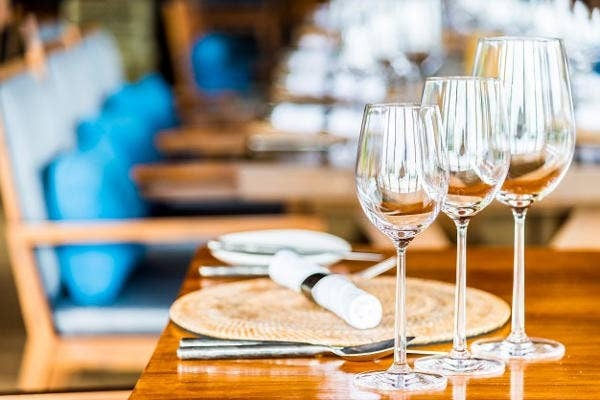 If you own the restaurant by yourself, get some suggestions from relatives, close friends who are involved in the food business, or even your customers. 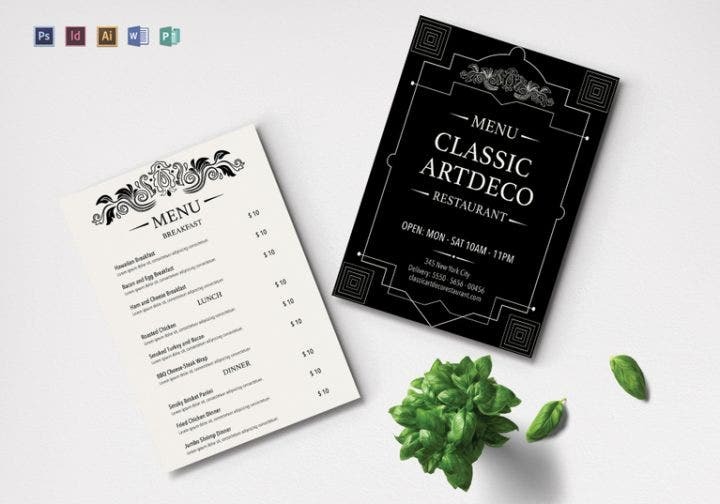 Why are you waiting to purchase these elegant menu designs for your fine dining restaurant? They are attractive yet very affordable, so buy one today. For your other graphic design needs, be sure to check out our featured daily menu templates and our gift certificate templates.